The reliable Xbox rumor site Xbox Archiv is reporting with more Black Xbox 360 rumors. This time it suggests rumors that have been around a long time and even more apparent today with a Spanish advertisement. Another interesting rumor in it is that the tard pack, Core edition will soon be dropped from retail shelves - a great sign that would make the premium core and the new version premium. As an early adopter how would that make you feel though? Even though it is nice with the tard pack cancelled. In EGM Peter Moore didn't dismiss the rumors of a new 360 by saying in this day there is always new technology in months, not years so it is quite possible that the new 360 is launched in May. Let's wait for Microsoft's comments on this. From reliable sources we experienced now that Microsoft plans release of a new Xbox 360 version in May 2007. 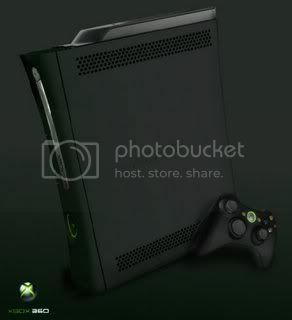 The new Xbox 360 will that already admits black model to be, which has an HDMI exit and a larger non removable disk (120 GB). The price of the new Xbox 360 will lie between €350 and €450, an exact product name is not present, the internal code name Zephyr is rather improbable as sales designation.